County public health officials have released only simple maps revealing clusters of a hepatitis A outbreak that’s sickened more than 480 people, citing privacy laws and other challenges. Without more specific location data from the county, cities are basing sanitation efforts on public complaints and areas where their homeless populations cluster. As a deadly hepatitis A outbreak booms, county public health officials aren’t sharing detailed location data on cases or deaths with the public – or with cities scrambling to help stem the health crisis. It’s meant cities including San Diego, El Cajon and Chula Vista are basing increased sanitation efforts on public complaints and areas where their homeless populations cluster rather than on detailed data and that the public has little information on where the virus is spreading. Maps released by the county show hepatitis A has spread most dramatically in downtown San Diego and El Cajon and appears to have clustered in other central city neighborhoods. The county hasn’t released more specific data on where the more than 480 patients who’ve contracted hepatitis A were living when they were diagnosed. County officials blame state and federal health privacy laws and challenges tracking the homeless and illicit drug-using populations hit hardest by the virus for their limited data-sharing. “We do not believe anything has been provided to the city other than what has been shared via the county’s public information-related materials,” said Greg Block, a spokesman for Mayor Kevin Faulconer. As of last week, at least half of the county’s hepatitis A cases had cropped up in the city of San Diego. A county spokesman also estimated that about 10 percent of cases have been linked to the San Diego River, an expansive area with dozens of homeless camps. A spokesman for Scripps Mercy Hospital in Hillcrest, where patients from downtown and other central city neighborhoods are often routed, said the hospital had seen nearly 85 hepatitis A cases as of late September, including three deaths. For now, local health officials are offering scant location information on hepatitis A cases. Dr. Eric McDonald, who directs the county’s epidemiology and immunization efforts, said that speaks to laws governing the sharing of medical information and the nature of both hepatitis A and the population disproportionately affected by outbreak. For one, homeless San Diegans rarely remain in one place for long. McDonald said the county’s based the maps it has produced on addresses where patients were picked up before being ferried to the hospital or the most recent address shared with health workers. It’s also tried to avoid releasing data it believes would expose personal health details and opined that in at least some cases, sharing where a person was staying might identify that individual. McDonald said the information cities are using to step up their sanitation efforts is sound. The county’s encouraged cities to allow hand-washing stations and step up cleaning efforts in areas where homeless people congregate since those locations tend to correlate with hepatitis A. That’s led officials in San Diego, El Cajon and Chula Vista to focus most on streets and parks where homeless people often settle. He argued more location information wouldn’t necessarily help combat the spread of the virus because most San Diegans aren’t at risk of contracting the virus unless they have close contact with someone with hepatitis A.
McDonald said the majority of the 125 people who’ve gotten hepatitis A who aren’t homeless or illicit drug users have worked, lived with or shared restrooms with people in those two groups. At least one other county has released more details on hot spots for its hepatitis A outbreak. Santa Cruz County has reported at least 70 hepatitis A cases, many of them among the homeless and drug-using populations. 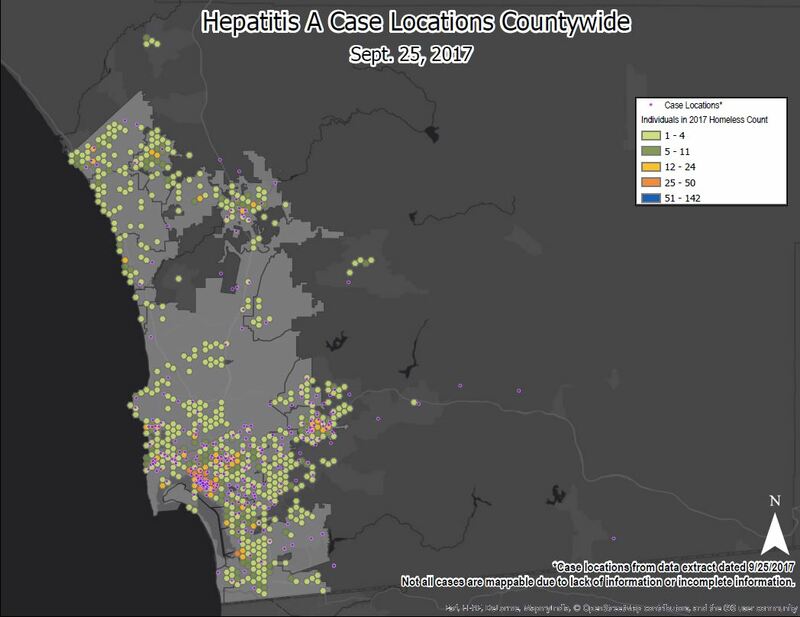 Last month, a Santa Cruz County spokesman shared a handful of ZIP codes associated with its hepatitis A outbreak with NBC 7 San Diego. Los Angeles County, which is also experiencing an outbreak, declined to provide more information. Sean Young, a UCLA professor who leads the UC Institute for Prediction Technology and advocates for greater sharing of health data, said that as technology improves, public health departments are weighing whether to provide resources necessary to collect and share detailed data, and how consumers might view the data. One major tension, Young said, is the lack of clear standards for health officials. “There needs to be some guidance and some standards that can be requirements that if you are a public health department, you need to adhere to the following guidelines or requirements on how you share data,” Young said. For now, San Diego County officials, including County Supervisor Ron Roberts, say they’re sharing all they can. “I’d like to say we’ve got this pinpointed but even where a death occurs, where that person has been, that’s problematic,” Roberts said.